Two year-old Kadyn’s favorite food was tomatoes. When we asked him what he wanted to be for Halloween, he decided was going to be a tomato, or as he pronounced it, “an amato”. 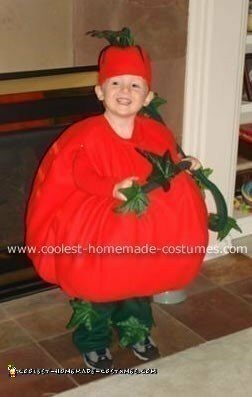 Now there was just one problem: where do you find a tomato Halloween costume? Lucky for me, my mother-in-law is quite crafty and jumped to the occasion. The tomato was cut in 6 sections, in the shape of an ellipse to form a ball when sewn together. The hat was made by sewing four rounded triangles. Made out of polar fleece. Green on top of hat is polar fleece cut in a pointed flower and a stem. Pants are polar fleece with leaves pinned on. They had a Halloween parade at daycare. It was so cute to see him with all of his friends dressed in his tomato costume. He waddled along…with all of the stuffing, he was the size of 3 of his classmates put together. Great costume! I want one! Cute! What is it stuffed with?